"Sabbath for the Sake of Life"
Mark’s Gospel moves at a fast pace. In the first chapter, Jesus is baptized, tempted, announces his ministry, calls his disciples, casts out an unclean spirit, heals many people, goes out preaching the gospel, and cleanses a leper. People are coming to him from all over. Then, we see the beginnings of controversy. When the scribes of the Pharisees see that he’s eating with sinners and tax collectors, they question his disciples about who Jesus is associating with. People question why Jesus’ disciples aren’t fasting. Jesus doesn’t deny the accusation. Instead, he appeals to a historical precedent, saying, “Have you never read what David did when he and his companions were hungry and in need of food?” He refers to a time when King David did something sacrilegious-- eating the bread of the Presence, that only priests were permitted to eat. This historical precedent doesn’t have anything to do with keeping the Sabbath, but seems to justify the idea that law gives way to need. Mark tells us that Jesus was deeply upset at their hard-heartedness, and looked around at them angrily. Then he healed the man’s hand. The Pharisees went out right away and began to plot with the Herodians against Jesus, trying to find a way to destroy him. As theologian William Placher points out, Jesus wasn’t breaking with Judaism, but could have been quoting a number of rabbinic texts. The line of division here runs not between Christians and Jews-- but between those in any tradition who lose sight of the point of the laws. This is where these stories reach beyond their original first-century context to speak to us all. My grandmother grew up in a time when many practicing Christians didn’t do non-essential work on Sundays. Their farm family would milk the cows and feed the livestock, but they wouldn’t have worked in the field or the garden. When she was older, Grammy decided that she could do fancy needlework on Sunday, because it was relaxing for her. But she wouldn’t mend clothes on Sunday, because that was real work. Some of us who are old enough probably remember a time when there were “Blue Laws” that set Sundays apart by limiting what was legal to do on Sundays. Stores were closed on Sundays, and a lot of gas stations, so you planned to buy your milk and bread and gas before Sunday came. Movie theaters were closed on Sundays. You weren’t supposed to play cards. In many states, you couldn’t buy liquor. There weren’t a lot of other things competing for our time on Sundays. I remember going to church on Sunday morning, and then packing a picnic into the car, or visiting relatives. Sunday evenings, we had youth group at church. For many people, the Blue Laws seemed restrictive and burdensome, and they eventually were discontinued. A lot has changed since that time. Some families are so stressed with working long hours that they’ll tell you Sunday is the only time they have to do the laundry or shop for groceries. Others are busy with a round of various activities. I don’t think many of us would want to go back to a time when there were laws dictating what we can do on Sundays. But I think our scripture texts invite us to take a fresh look at keeping the Sabbath. 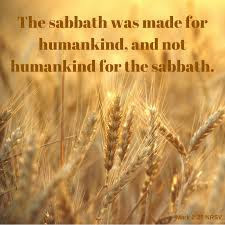 Keeping the Sabbath was one of the Ten Commandments, and it was reinforced by the prophets and by Jewish teaching. It was one of the things that made Jews distinctive from their neighbors. It was a sign that they belonged to the true God, the Creator of the world, who had rested on the seventh day. The Ten Commandments begin with the Exodus from Egypt: “I am the LORD your God, who brought you out of the land of Egypt, out of the house of slavery. The people remembered that Egypt’s socioeconomic power was organized like a pyramid, with a work force producing wealth, all of which flowed upward to the power elite and eventually to Pharaoh. When they heard the commandment to observe the Sabbath, they would have remembered that there had been no Sabbath in Egypt, no rest from work for slaves, no rest for anybody in the Egyptian system, because frantic productivity drove the entire system. In the commandment to keep the Sabbath, YHWH abolishes the entire system of anxious production. The good news is that Jesus offers us an antidote to anxiety. The antidote is abundance, the outpouring of generosity of the creator God. We need the Sabbath for our own personal well-being and for the abundant life of our neighbors. If we keep the Sabbath, we don’t get to overlook neighbors whose lives are being threatened on a daily basis. If we keep the Sabbath, we don’t get to ignore how the lives of neighbors are being stripped of their dignity and worth. God invites us to Sabbath rest because it is life-oriented and life-giving, and because it can create a Sabbath-shaped way of looking at all of life. When we come to the Table, we hear again Jesus’ story of abundance. We who follow Jesus have decided that this story is true. The four great verbs: he took, he blessed, he broke, he gave. This is the true story of our lives. So, come to the Table to be fed by Christ. Taste his bread and drink his wine. Know that God is good! Amen! William Placher, Mark: Belief, A Theological Commentary on the Bible. Westminster John Knox Press, 2010. Kindle Edition. Walter Brueggemann, Sabbath As Resistance: Saying No to the Culture of Now. Westminster John Knox Press, 2014. Kindle Edition.